Tobacco Dock Hotel: What’s the Secret? Messila House, the owners of Tobacco Dock have announced redevelopment plans for a new hotel and piazza. A formal planning application will be submitted to Tower Hamlets Council by Messila House later in 2010. Just How Public has the Consultation Been? Incidentally they said they’d sent 2000 flyers out locally. I didn’t get one. It was only through this site that I and my neighbours knew about this presentation. The flyers didn’t make their way to residents in Wapping High Street and we’ve yet to meet anyone who received one other than Jon who kindly provided it to us. We are not instructed at the moment to issue any material as the proposals are still in the pre-planning stage. We will be considering all the comments from local residents who attended the exhibition before finalising the proposals and the design. However, I would be happy to meet with you and show you the boards that were on display at a time which is convenient to you and of course answer any questions you may have. Share Your Views Before it’s Too Late! Whether a hotel and plaza is the best use for Tobacco Dock is open to debate, but most agree it’s a tragic waste to sit empty. Share your thoughts here or directly to the proposal, but have your say before it’s too late! 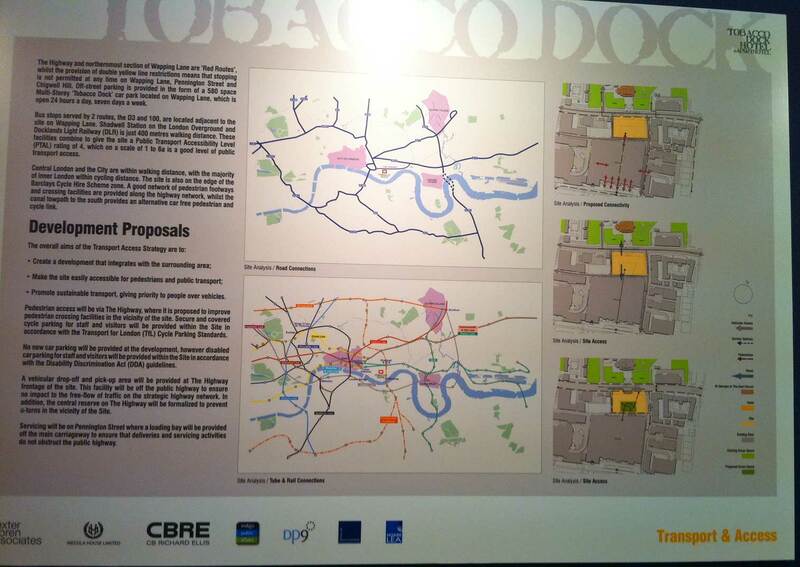 Tobacco Dock Hotel Transcript – What Happens After the Exhibition? The designs will be reviewed and finalised into a planning application and submitted to Tower Hamlets Council. Tower Hamlets Council will undertake its own statutory consultation on the application. We would like to hear your thoughts and ideas on the proposals for the empty site between the Highway and Tobacco Dock. IMHO Wapping needs more shops and restaurants, not hotels. The previous shopping arcade in Tobacco Dock was clearly a commercial failure but then the sheer number of new residents in the area since the early 1990s would almost certainly make a huge difference to the likely success of any retail/restaurants opened there now. I don’t think the proposal is a bad one but do question how likely it is to be commerically successful. The location is a little out of the way for both business travellers and tourists. 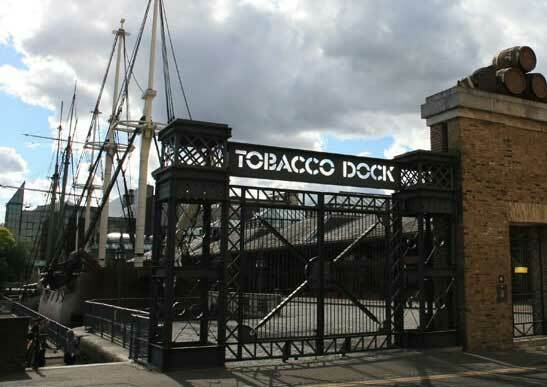 I agree that we need something new in the area, but getting Tobacco Dock back up and running should be a priority. Perhaps that’s in the works, too? Seems strange the developer would propose a hotel without attaching it to the other. From the timeframe, maybe the developer is trying to get the hotel in operation before the Olympics. As for the arguments for brick and no metal…really? We’re not living in the past and the city is changing. As long as the design is sensitive to the area, I don’t care much about what the material is. Besides, if I had a choice between the developer building a metal and glass building and helping fix the area or having them abandon the project because brick building is too expensive, I’d choose the former. Let’s work to fix our area! I noticed that the building that was on the site of Wapping 21 has now gone. Looks like they mean business. Just to say, I got a flyer, here in Prusom Street. I’m much more annoyed by Wapping 21 than this one. We live right opposite the site in Eluna Apartments in Wapping Lane. We were not notified by the developers at all of this meeting and no leaflets were handed out – very disappointing start…. Fortunately the school won’t be appearing there. Lets bring jobs and tourists to the area which will have a positive benefit to the local economy, not alcohol, drugs and anti-social behaviour. as I understand it, the ‘consultation’ was an attempt by Medina House, working through Indigo Public Affairs, to reduce the number of objections when they file for planning permission. It has no legal standing and is entirely optional. I went along to the unadvertised unknown “public”, consultation which if it wasn’t for this site I would have never heard of and I only live 100 yard away from the site. These publication consultations should have minimum attendance numbers set, otherwise there is little incentives to be too open and public as you have to adhere to what others want not what you want, take Wapping 21, how did that get planning, all the comments I heard were brick, no glass, no metal, exact opposite of Wapping 21 so how did that get planning, consultations on the quiet is my guess – we really should seriously looking into get that project size and design changed even at this late stage, once up it will be up forever. I think for sure they want or wanted to (post feedback) to create a glass block hotel, I don’t buy the PR persons take that this was a temporary drawing, all planning applications show a design of the actual look and feel of the building, after all this is the single most important part of the planning, especially after the drawings were so detailed on all other aspects. Who attends a planning presentation without a building design, no-one, care should be taken to ensure if planning it is 100% condition on design being in-keeping with the area and in-keeping is stipulated by residents not builders / designers / developers, who have a vested interested in keeping down costs and cutting corners. There is only one shop that faces the road, who would know about or use that? TD – agree should be conditional on getting this lovely structure working as a venue, if they don’t want shops in the plaza then there should be a minimum condition of number of shopping units to be create in TD or as earlier suggestions, why not let this at cheap rent for local businesses to have office space currently TD is split into units and could be easily used for such but it stands wasted and dis-used. Pier – contribute enough to get this project off the ground, same if not more than that which Ballymore bribed THH with to build Wapping 21, does anyone know how much they have contributed? An active pier can only make more access to the hotel. As residents I think we need to be very organized to ensure that one consistent message gets through to the developers so that they can’t play one idea off against another, this way we can be sure of the way this development will be managed. Interesting report Josephine. I certainly didnt get a flyer. Anyone else get one? I think their comment about cars has some validity but i think their comment about hoping it would generate interest in Tobacco Dock is, well, shall we say hopeful? Disingenuous might be more accurate. I think any permission to build the hotel should be tied to getting TD full and working. I popped in to see the exhibition (good to discover the Wapping Tenants Association Social Club building complete with giant glitterball and sold out New Year Party posters!). Anyway, I digress…! The architect and a PR person were there. They kept stressing that at the moment the project is an idea with nothing set in concrete regarding the plans – they need to hear what locals think before they get to that stage. The hotel is planned to be 7 storeys I think. It would be 4* luxury. Another question raised was parking. They said firstly that they were aiming at people who would arrive by taxi mainly or that the area is so well served by public transport cars wouldn’t be necessary. Secondly they said there is plenty of empty space in the car park opposite. They wouldn’t be creating any more parking space as part of the project. Incidentally they said they’d sent 2000 flyers out locally. I didn’t get one. It was only through this site that I and my neighbours new about this presentation. Wondering if anyone out there got the flyer? Personally, at this stage I’m undecided. Need more info on how they are actually planning the hotel to look. I’m slightly dubious about whether a hotel would work there but I may be being shortsighted. If they get planning permission they are, of course, hoping to catch the 2012 crowd but would the momentum remain after that? I don’t know. If it doesn’t will we just be left with two empty buildings next to one another? No, didn’t manage to speak to any architects, but will share any information as soon as we receive it. Cool! Look forward to seeing those. What did the architects have to say or didn’t you manage to get a chance to speak to them? 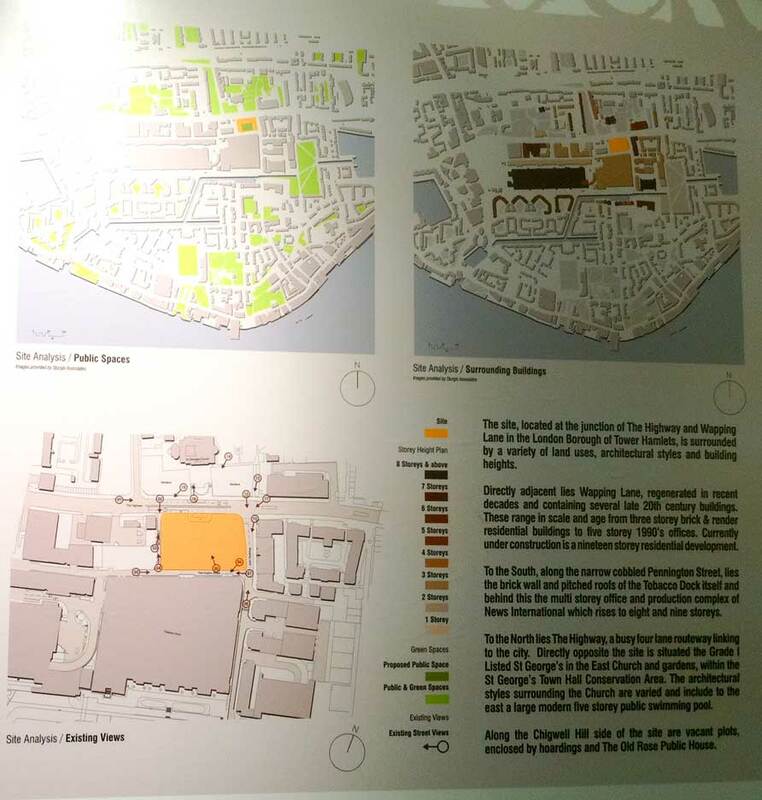 There were some display boards showing the proposed plans at the public exhibition this week. We’re trying to get hold of a copy we can post here, so will update as soon as we can. Did anyone manage to get to the show of the plans for this? Would be interesting to know more. I think a hotel is a good thing if it brings more jobs to the area, but I do worry that these are the same people who have left Tobacco Dock empty. I don’t know the full details of what stage the plans are at but we should keep an eye on it and feedback to the appropriate authorities. I think Mark makes a very good point, there should be greater contributions to the community if these plans are to go ahead, current offering, as with most proposals, are the initial base the hope to get away with. I think office space for small started businesses is a very good idea as there is nothing around Wapping at all and could offer long term higher paid jobs to the area. The Wapping Lane development, looking at the planning permission, were asked to make a £1.25M contribution to a new health centre which the planners rejected however were happy to approve a property that doesn’t meet environmental or density parameters set? Does anyone have any views on this monstrous 24 storey development. Guess you can work out my views on the project! Can this planning be reverted or scaled down, or at least built in a material other than metal clading which is more appropriate for Canary Wharf than Wapping? Views welcome. News International development is including retail space in-between their current building and TD. That combined with a new hotel could be the nudge they need….though I’d sooner the school was put in there, even if it’s not particularly practical! 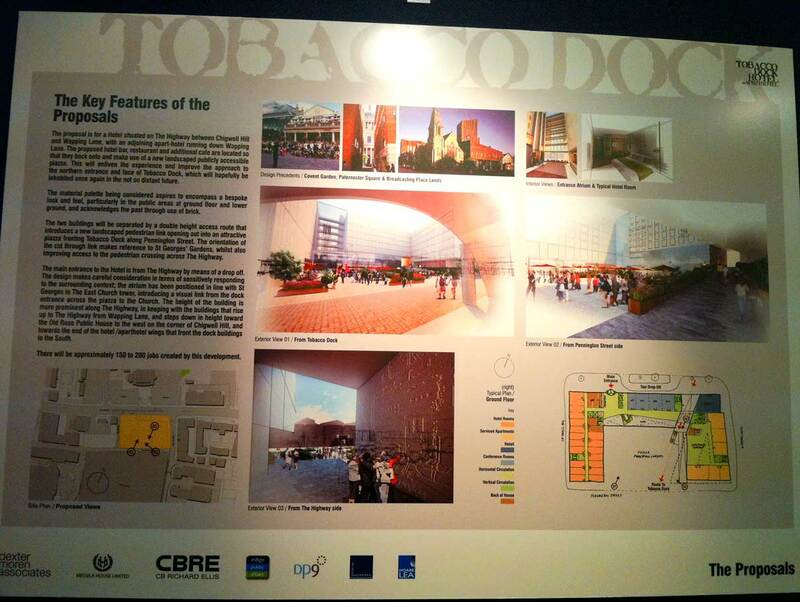 Er… maybe Mesilla House should put their minds to getting Tobacco Dock filled before they build something else? Although it would be very funny indeed if they did build their new hotel and no one ever stayed in the rooms Doh! One thing that bothers me about this plan is that it seems all they are proposing for the community is a new ‘plaza’ and ‘improved pedestrian linkages’ which I think means pavements. Now call me cynical but a ‘plaza’ is just some empty ground with a bit of landscaping and some turf. Dead cheap, no? I think it might be more useful if they built something for the community, maybe some small units for business start ups or live/work spaces? That might even cost them some money….